It seems that the modern trend towards smaller and faster has led to the CompactFlash card being relegated for use in industrial and professional high-end photography only, where its larger size is not a problem. Most consumer electronics have since transitioned to SD or microSD cards, with the in-between miniSD pretty much disappearing from the market. CompactFlash was a very important milestone in the flash memory industry. Being “intelligent” and having an internal controller to manage the flash (unlike SmartMedia), it was able to overcome defects, and extend capacity and speeds throughout the generations (mostly) without losing backwards compatibility. It was also led by consortium, and was not limited to just one player, which helped it become popular standard with many vendors of cards and compatible devices. 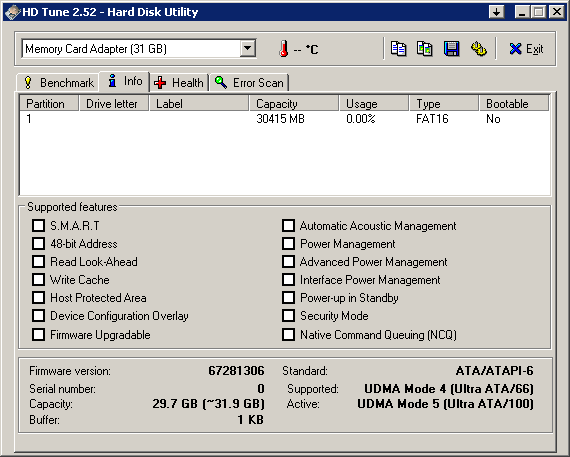 The cards could operate in one of three modes, and the True-IDE mode was popular as it allowed passive adapters to connect the cards to IDE interfaces as use as a rudimentary “slow” SSD before high-performance SATA SSDs became popular. Many high performance cards used MWDMA and UDMA modes which are common with speedy IDE hard drives to achieve high speed. Passive adapters were also available for use with PCMCIA interfaces. Unfortunately, CF cards are starting to become less easy to find, and by extension, high capacity and high performance CF cards often command twice the price of a similar performing SDHC/SDHC card. Many users are likely to have many SDHC/SDXC slots to use cards in, and laying down a significant amount of cash buying CF cards with the knowledge they won’t be able to use it with their next camera doesn’t seem to make sense. It turns out that this was the exact conundrum I was facing in late 2011/early 2012 when I was considering upgrading from my Canon EOS 400D which used CF cards to something more modern. The EOS range had already decided to go over to SDHC, so I knew the future for CF, at least on consumer oriented devices, was limited. I really didn’t want to spend more money buying CF cards knowing I won’t have much use for them later on. Instead, I spent about $15 each on two different adapters that were on the market in late 2011. It seems that these products, possibly revised, are still on the market today. The one on the left is the “extreme” adapter, the one on the right is an unbranded “blue” adapter. Both adapters feature a full size SD card input, and I specifically purchased them as they supported the SDHC format, so as to be sure they were capable of using cards up to 32Gb. The slot on the extreme adapter is the “push to eject” type, whereas the blue one on the right is a friction-fit type, and pull to remove. The rear of the extreme adapter has a very generic label, with uneven line lengths, and claims to be made in Taiwan. The blue adapter has no label on the rear. Both adapters are Type II, which is of 5mm thickness. This thickness was originally designed to accommodate microdrives, and not all devices will have slots that can accommodate it. The Type I thickness is what most regular CF memory cards are made in, and is 3.3mm thick. There are newer designs which are Type I (thin) microSD based adapters. There are also some with multiple slots and a type of striping between the two cards for performance, however, it seems the cards cannot be read outside the adapter. Funnily enough, the Transcend RDF8 card reader that I use most has a slot cut-out that can only accommodate Type I cards. Removing the PCB from the shell allows for Type II cards to plug in, and thus it was tested without the external casing. What we really want to know is just how well these adapters work. Testing of the adapter focused first on read performance and the types of cards accepted. Interestingly, using HDTune Pro, we determined that the adapter works for SD (not pictured), SDHC and SDXC cards. 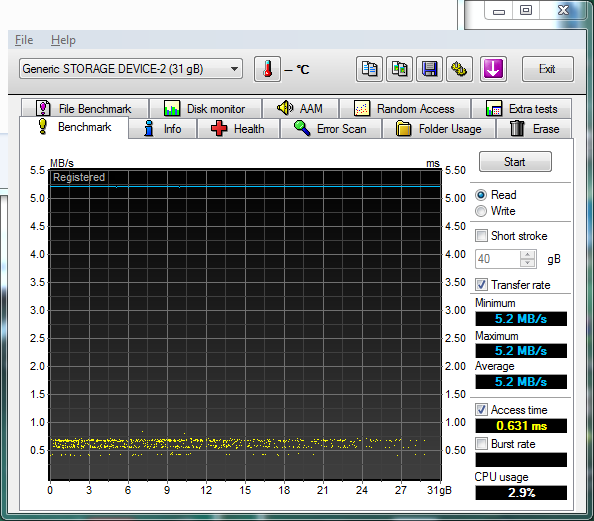 It was tested up to 128Gb and performed correctly! In testing the performance, I have chosen the best performing cards from the database to test with. 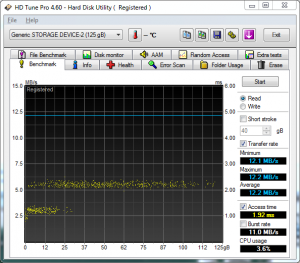 There appears to be a compatibility issue with the Sandisk Extreme microSD card, which results in a low rate of just 5.2Mb/s regardless of number of re-insertions. 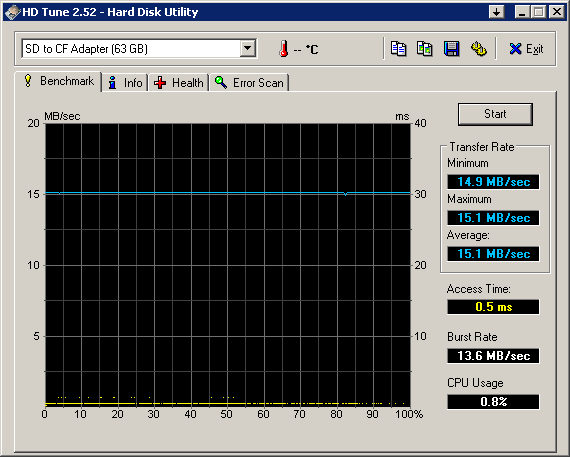 The rest of the cards seem to be capped off at 12.2Mb/s, which is a lot slower than the cards are capable of. This is only a speed of about 83x, which when compared with CF cards that can perform at 133x, 200x, 266x, 300x, 500x, 600x and above, it’s not extreme by any means. 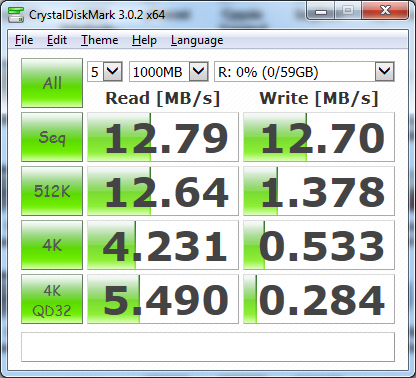 A CrystalDiskMark test was run with the Toshiba Exceria Type 2 64Gb SDXC card, which resulted in a rate of about 12.70Mb/s both ways. It’s clear the adapter is hampering performance. A check using H2TestW showed no corruption, which is a good sign. 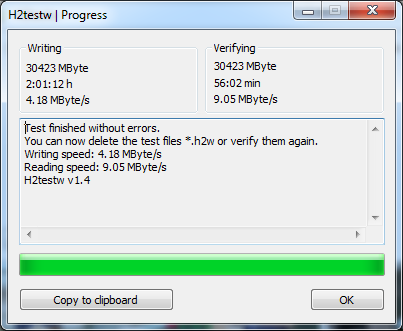 The speed is a consistent 12Mb/s both ways. Testing the blue adapter seemed to run into some trouble. It was quite picky with cards, and had difficulty with the Toshiba Exceria HD 32Gb microSDHC and my Samsung 32Gb Class 10 SDHC card, claiming it was unformatted and was not able to complete the format. 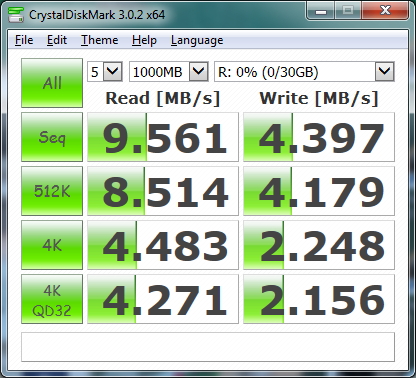 It did, however, work fine with the Sandisk Extreme 32Gb microSDHC. No SDXC cards worked in this unit. The transfer rate was an even lower 9.1Mb/s which translates to 62x which is below even the basic 66x cards sold ages ago. The performance is not consistent either, with writes showing half the speed. This is highly undesirable, especially when used for photography with mid to high end DSLRs. 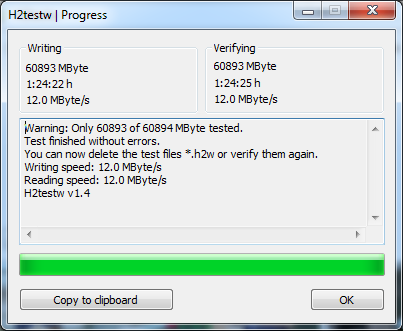 No corruption was experienced, however, similar speeds were shown. Retro-computing users might have particular interest in these cards as CF cards start to get rarer as the true-IDE mode should allow these cards to be used in place of less reliable rotating-platter style hard drives. Testing the two adapters provided rather interesting results. 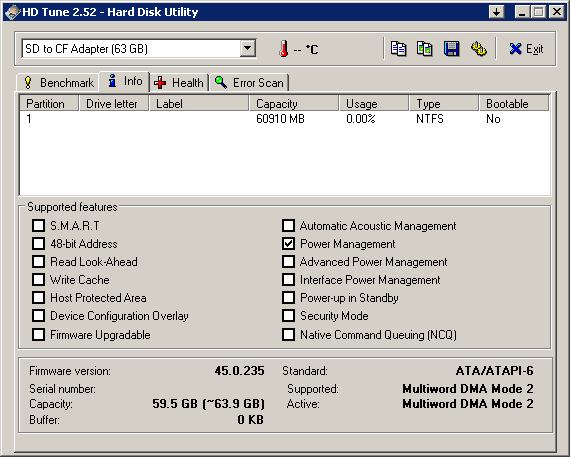 The extreme adapter identified in the BIOS incorrectly, with cards larger than 8.4Gb always identifying as 8.4Gb (16383/255/63) CHS mode. However, once booted into Windows, the full capacity is accessible and usable in True-IDE mode. The unit performs slightly faster, but is limited by its MWDMA2 mode (16.6Mb/s maximum). It identifies as SD to CF Adapter with firmware version 45.0.235. With the blue adapter, while the adapter and the size are correctly identified in the BIOS, all cards tested with it claimed to need formatting, which could not actually succeed. However, reading from it, and performing read benchmarks were possible. The unit identifies itself as Memory Card Adapter with firmware 67281306. It seems to implement a very high UDMA4 mode, however, the BIOS has limited it to UDMA Mode 2 (33Mb/s) because of cable/adapter limitations. So despite having the most desirable mode for a hard disk replacement, the adapter itself is still very slow and will not function correctly at least in LBA mode. It seems the true IDE mode has not been correctly or completely implemented. I also double-checked the write protection switch on the SD card, and verified it worked properly with the reader before and after a failed test internally in a CF to IDE adapter PCB. Photography users might get rather concerned as well, as using these with my 400D occasionally resulted in Card Error, which could be resolved sometimes by removing the card and re-inserting it (and losing a few photos in the process) or occasionally losing the whole filesystem altogether and requiring file signature analysis for recovery. It seems it’s not a good candidate for speed or reliability. Another thing that might be worth worrying about is power consumption. These adapters get fairly warm, so I suspect they may be consuming more power than most CF cards, and will shorten your battery life. Using adapters may seem an obvious solution to a problem, but in this case, it comes with many caveats. The units I had displayed puzzling behaviour, with compatibility problems and inconsistent performance. Performance in general, was very poor, even when working correctly. I find it hard to recommend because it seems hard to get a reliable working set-up without bumping into random errors here and there, and due to the numerous caveats which depend on your application. It seems it is no substitute for buying a quality, even if low-rated CF card. The market has, likely, moved on a little since I had purchased these adapters, but you might want to ask yourself whether it’s worth the risk … I don’t think it is, so I probably won’t be trying more of these. This entry was posted in Computing, Photography and tagged adapter, flash, review, tested. Bookmark the permalink.